UMass Lowell enters the weekend's two-game home stand riding a three-game win streak after sweeping Colgate twice on the road. - #1 UMass and #8 Northeastern are set to meet for the first time since last year's Hockey East Quarterfinal round that saw the Huskies advance on to the semifinals at TD Garden in a top-10 national matchup. Both games will be aired on NESN or NESNplus. The two teams split the 2017-18 regular season series 1-1-0, with each team earning a shutout on home ice. 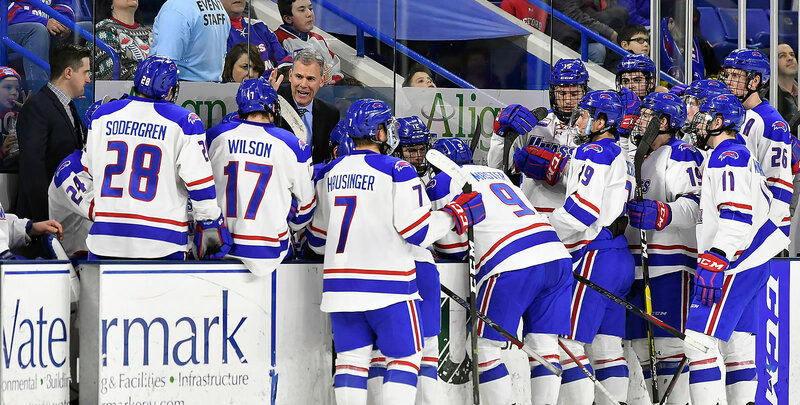 - The Minutemen are coming off of a weekend sweep of Vermont that earned them four more points in the Army ROTC Hockey East Standings. They currently sit in first place with 18 points after defeating the Catamounts by scores of 4-1 and 5-1 to jump out to a 9-1-0 record in league play. - Sophomore Cale Makar (Calgary, Alta.) earned Hockey East Defensive Player of the Week honors after helping the Minutemen defense hold Vermont to just two goals and 43 shots on net in two games. He also recorded two goals and two assists over the weekend and was named to the Hobey Baker Memorial Award fan ballot this week. - Northeastern returns to play after taking four points on the road at Maine. They defeated the Black Bears, 3-2, on Friday, before shutting them out, 4-0, on Saturday. - Cayden Primeau (Voorhees, N.J.) recorded 52 saves on the weekend, including 33 on Saturday to earn his third shutout of the season. - The River Hawks and Catamounts clash for the first time since last January's series. Vermont won that game, 6-2, but UMass Lowell took the regular season series against the Cats, 2-1-0. - UMass Lowell enters the weekend's two-game home stand riding a three-game win streak after sweeping Colgate twice on the road. - Senior goaltender Christoffer Hernberg (Espoo, Finland) recorded 48 saves on 49 shots at Colgate, including 25 in Friday's 3-0 victory to earn his second shutout of the season. - Merrimack is currently riding a season-long three-game win streak when they take on New Hampshire and Boston University in Hockey East play. The Warriors have already met each team once this season, shutting out the Terriers, 4-0, on Oct. 20, and dropping a 2-1 overtime decision to the Wildcats on Jan. 4. - First-year head coach Scott Borek's team defeated UConn in its most recent outing on Jan. 12, 5-2. Freshman Chase Gresock (Powell, Ohio) posted a goal and assist in the meeting with the Huskies. He also netted a goal and dished out two assists in Jan. 8's road win at Michigan. His five points on the week tied for the league lead among all players and helped earn him Hockey East Player of the Week honors. - Boston College and Providence clash for the second of three meetings this season on Saturday night. The Hockey East opponents faced off for the first time last Friday, with the Eagles skating to a 4-2 victory and snapping the Friars six-game unbeaten streak in the process. - The Eagles have gone 1-2-0 most recently, snapping a three-game slide with Friday's win over Providence, before falling to New Hampshire, 6-4, on the road. Senior Christopher Brown (Bloomfield, Mich.) put up three points over the weekend on two goals and an assist. The forward also won 71% of his faceoffs. Boston College was then upended by Maine, 7-2, on Wednesday night. - Providence played three games in five days last weekend, posting a 1-2-0 record in that span. The Friars dropped four points in league action with losses to Boston College and Boston University, before bouncing back to defeat Brown, 5-1, in the annual Mayor's Cup. - Junior Josh Wilkins (Raleigh, N.C.) continues to pace the Providence offense, netting a goal in all three games to push his point streak to 13 games, the longest in the NCAA this season. He has posted 19 points (7g, 12a) in that span and currently leads all Friars with 26 points (9g, 17a). - Boston University enters the weekend riding a five-game unbeaten streak dating back to Dec. 8 (4-0-1). The Terriers take on non-conference opponent Quinnipiac for the first time since Oct. 8, 2017 when they skated to a 3-2 overtime victory over the Bobcats, before hitting the ice with Merrimack for their second of three games this season. They were shutout by the Warriors, 4-0, back on Oct. 20. - In their last two, the Terriers defeated New Hampshire, 5-2, on home ice, before taking two points on the road at Providence with a 4-3 victory. Joel Farabee (Cicero, N.Y.) earned Pro Ambitions Rookie of the Week honors after posting one goal and three assists on the weekend. The freshman also netted the game-tying goal in last Tuesday's 2-2 overtime draw at Harvard. - New Hampshire is on the road this weekend in a stretch of four away games in five tilts as the Wildcats take on league opponents Merrimack and Maine. It will be the second and final meeting of the regular season with the Warriors, who the Wildcats currently hold a 1-0-0 advantage over, and the first of three contests with the Black Bears. - The Wildcats are coming off of a weekend that saw them go 1-1-0 against Boston University and Boston College. They dropped a 5-2 decision on the road against the Terriers, but bounced back with a 6-4 victory over the Eagles on home ice. UNH is 6-2-3 in its last 11 games. - Forward Liam Blackburn (Prince George, B.C.) pushed his point streak to 11 games with three goals over the weekend. The junior has tallied 15 points (6g, 9a) in that span. - Maine bounced back in a big way with a 7-2 win at Boston College on Wednesday after dropping two games on home ice to Northeastern in league play last weekend. They came up short in a 3-2 loss on Friday night, before being shutout, 4-0, on Saturday.